July 6 2014: Review from N.M (mountain biking group). "Hi Rachel; Just a quick note to say thanks for the efficient, flexible and professional service provided by you and Dean for our trip to Morzine last week. All five of us had a fantastic holiday and Chalet Hulot was perfect for us. Hopefully see you next year!" 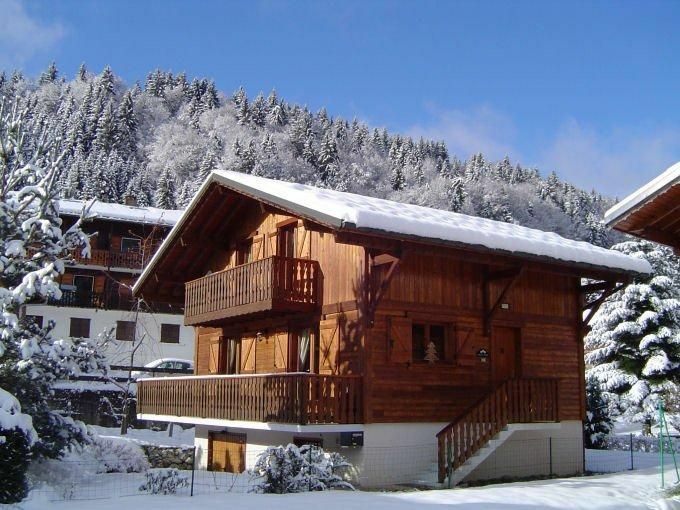 A spacious stand-alone chalet sleeping 10 people, ideal for families and groups, situated 700m from the centre of Morzine. Chalet Hulot is in a quiet setting, down a small access lane off the flat Route de la Plagne; it takes 10 minutes to walk into the centre of Morzine or to the SuperMorzine lift (or 2 minutes on a bike). The chalet has a light and airy open-plan lounge, with comfy sofas facing the woodburning stove, and flatscreen TV / DVD with UK freeview channels and Wii console, and an IPod dock. There is a large pine dining table, and a well-equipped kitchen, and a balcony running along both the sunny sides of the chalet. On the main floor is a shower room and separate WC. Upstairs is a large family bathroom (bath, shower attachment and WC), and 3 bedrooms opening off the central landing. (1 large king bedroom with balcony, 1 large quad room with balcony (2 sets of bunk beds) and 1 smaller twin bedroom which can also be made up as a king). On the lower level of the chalet are 2 new bedrooms; one is a double and the other a twin that can be converted into a king-size bed, and a large bathroom with bath and walk-in shower. There is also a utility room with washing machine and tumble dryer, and ski and boot storage area. The chalet is ideal for summer holidays as there is a flat garden on 2 sides, a BBQ, plenty of space for bike storage, with hose-pipe for washing bikes down. The chalet has central heating via radiators. There is parking in front of the chalet as well as additional parking for 1 car 20m away.